The biggest shopping holiday of the year has passed us again! What wisdom has Black Friday and Cyber Monday bestowed upon the email marketing world this year? Download your own copy of the infographic! Comparing email opens year over year, we saw the peaks before both Black Friday and Cyber Monday hit earlier, indicating customers started looking for deals earlier in the week than in previous years. Smartphones were the device of choice on Black Friday as opposed to Cyber Monday shoppers preferring to open emails for deals on desktops. Design your emails accordingly, or make sure your emails are responsive! Although we saw overall preferred devices for each day, device preference as well as email read length varied by industry vertical. Excentus has spent more than fifteen years developing technology that makes it easy for consumers to save money on gasoline and convenient for businesses to build loyalty by creating value for their customers. Their growing Fuel Rewards Network® program provides members with the opportunity to earn free gas simply by purchasing the things they normally would from more than 1,400 retail locations, nearly 700 online merchants, and 10,000+ restaurants. To date, Excentus has helped more than 25 million consumers save hundreds of millions of dollars on fuel. Movable Ink: Why did you decide to partner with Movable Ink? Excentus: We are growing fast, we have a good product, and we don’t have a big marketing team. We were looking at tools that would allow us to be more efficient. Movable Ink saves us time and increases the relevancy to every opener. Things like live creative optimization and in the moment targeting are easy with agileEMAIL vs. having to do it on our own. We saved a lot of time and improved in an area we wanted to improve in. MI: How has it been working with Movable Ink so far? E: Working with Movable Ink has been great so far. The Client Experience Team is always available, and quick to respond. They share ideas with us, are efficient, timely, and do great work with our team. We appreciate their help for sure. MI: We’ve been partnered for a few months now, what has been your favorite use of agileEMAIL so far? 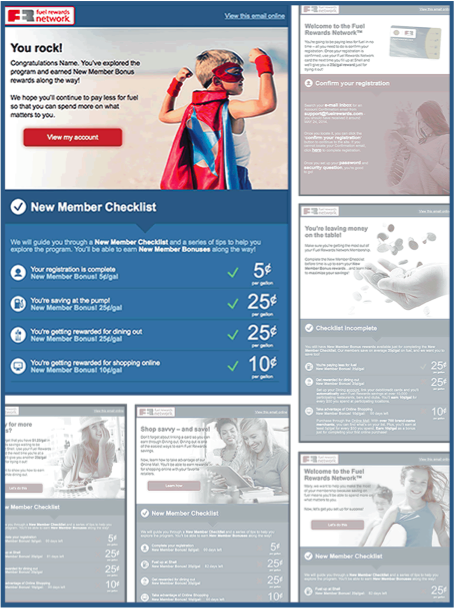 These screen shots show off the different stages of the new Excentus Welcome Series powered By agileEMAIL. E: One of our favorites was one of the first things we implemented with Movable Ink. We had low participation in our Fuel Rewards Network® program across the member lifecycle. After digging in we attributed it to a lack of understanding of how the program works; after all it’s free gas, it should market itself. In April, we changed our “all at once and good luck” welcome email to a new series utilizing agileEMAIL to power five focused, digestible, highly personalized emails that educate members and reward their participation in the Fuel Rewards Network® program. It worked. Fuel Rewards earned in the first month increased 94%, and another 68% in the next month! The success of the welcome series showed we needed to expand our use of agileEMAIL to other programs too. MI: That’s a great! The end result improved, but how did it impact subscriber traffic? E: We classify our traffic into two buckets. The first is “low value” traffic which lands on content that isn’t likely to drive a conversion. The second is “high value” which is traffic that lands on content that is likely to drive a conversion. With Movable Ink, we can localize and personalize message content for every member when they open an email instead of trying to do it before we send. Now we can show nearby locations where members can earn rewards and alter the message content and calls to action based on the device they used and rewards available to them. These capabilities helped increase high value traffic by 21% and our click-through rate by 24%. MI: What are your future plans for agileEMAIL? E: Right now we are generally sending out one size fits all campaigns. Over the next six months, we are going to incorporate agileEMAIL into other campaigns, especially win-back emails to wake up dormant members. We need to get to a more 1:1 relationship with our members. Customizing the communications over the customer journey is a big deal and we plan on using agileEMAIL to help us achieve that. MI: Thank you for your time Coleman! Click here to download the full Excentus Case Study. For more information, please contact us at contact@movableink.com. Apple Pay™ launched on October 20th; which is exciting for marketers! Why? Apple Pay™ is going to put an even bigger emphasis on the importance of mobile as consumers can complete purchases by simply scanning their finger on their iPhone (6 or 6 Plus) or iPad (Air 2 or Mini 3). It’s being championed as the solution that will start the consumer shift to mobile payments. But what does that mean for you and your email program? 1. How can I use email to now drive even more mobile sales? 2. How can I target mobile consumers by their device and location to drive Apple Pay users into stores? 3. How exactly does Apple Pay work – I want to see this 2 click conversion! Lucky for you, we’ve answered those questions in our webinar already. A replay of “Getting Mobile Consumers to Bite with Apple Pay” is available for you to watch here. If you have any questions, please reach out and contact us at contact@movableink.com. The 2014 holiday season is upon us! Our quarterly U.S. Consumer Device Preference Report is out and has deep insight into how consumers engage with their devices, the popularity of these devices, and how device preferences varies across the nation; use this information wisely to target and personalize your holiday email campaigns. Unlike other studies, this data set exclusively includes results from large, enterprise B2C marketers. The report is free for you to download, and you can get a copy here. It may not be a surprise that the Q3 2014 report strongly confirms that U.S. consumers prefer to use their smartphones to read email, with the device accounting for 48% of all email opens, but did you know retail consumers tend to show a mobile preference while finance and automotive consumers show a desktop preference? This quarter’s report goes on to break down device use and other engagement metrics by six major verticals (automotive, financial services, media/entertainment/publishing, retail apparel, retail non-apparel, and travel/hospitality). – New to the report for Q3 is how consumer behavior and device preference varied by vertical. Longer email read lengths were seen when consumers preferred desktops and shorter read lengths occurred when consumers preferred smartphones in a particular vertical. – Tablet use picked up again during the quarter and well accounted for almost 40% of opens during prime after work hours. – Apple’s iOS devices continued to widen its lead over Google’s Android devices. However, Android users stay engaged longer with email. The full report is available as a free download here. The Q3 2014 U.S. Consumer Device Preference Report is based on data collected through Movable Ink’s agileEMAIL platform between July 1, 2014 – September 30, 2014. They reflect aggregate statistics across Movable Ink’s customer base, which includes more than 200 enterprise B2C & B2B marketers from the retail, travel, financial, media, and telecommunication industries. Because determining email opens requires images to load, the percentages for some devices might be over or underrepresented. If you have any questions about the report or if we can help you get responsive for the holiday season contact us at contact@movableink.com. A few weeks ago we discovered that Apple had changed the way it rendered HTML 5 videos in email on iOS 8 devices. Here’s a recap. Let’s say you used agileEMAIL to embed a video in your email (because we know including videos within email makes it more engaging). When subscribers opened your email, your video would appear as a poster image with a play button, but the video didn’t play within the email itself. On top of this, your subscribers had no easy way to reach the video’s targeted landing page once video playback was complete. It isn’t clear that Apple will revert back to the way they used to handle video in email—so our Engineering team crafted a solution within agileEMAIL that works with iOS 8 AND improved on the user experience! • When subscribers open an email with an embedded video, the video poster image appears with a play button. • When the play button is tapped, QuickTime is launched within the mobile version of Safari, and the video plays in fullscreen mode. • In addition, you can now direct subscribers to the video’s targeted landing page—after video playback is complete, your subscribers can tap “Done” followed by the browser’s back button. This launches the video’s targeted landing page within Safari, making it faster and easier for your subscribers to reach the video’s landing page. If you have any further questions about this, please contact your Client Experience team, or email support@movableink.com. Just ahead of the iPhone 6 launch last week, Apple rolled out the latest version of its mobile operating system, iOS 8. The release brought a number of great new features, but it also contained a few bugs. We’ve conducted some testing on the Mail app in iOS 8 and have identified that HTML5 video is not functioning as expected. Videos appear as a poster image with a play button, but when you tap the button, the video doesn’t play. All other versions of iOS continue to play video correctly, and as of today, only about 7% of all email opens have been from recipients using iOS 8. In the meantime, our developers are working to identify any possible workarounds that could be applied from our side to resolve the issue. Check back with us as we’ll post updates soon as we have more information. The following post is an excerpt from a story that appeared in the September 2014 edition of Direct Marketing News covering Comedy Central’s marketing program. Written by Elyse Dupre, Associate Editor. Copyright Direct Marketing News 2014. Click here for the full story. Content that’s in sync with consumers? Nooice! …if Comedy Central wants consumers to engage with its content experiences, then it needs to make those experiences valuable and accessible. So, instead of forcing consumers to search for its content, Comedy Central puts the right content in front of them on the right platforms. One way Comedy Central does this is through email. By working with real-time email marketing company Movable Ink, Comedy Central updates its email content dynamically based on its subscribers’ open times. For instance, if customers open a Colbert Report email in the afternoon before the show airs, Comedy Central can include a tune-in-tonight message with a preview link, Steele explains. But if they don’t open the email until the next day, Comedy Central can change its message to information about last night’s show and include a link to the full episode. In this email promoting Comedy Central’s tosh.O show plays a video in the message to promote the new episode, and can change call’s to action after the episode airs. 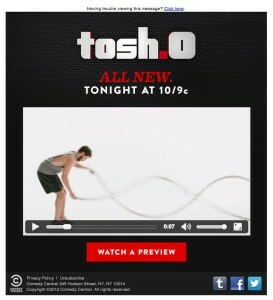 Adjusting email content based on device is another way Comedy Central stays in step with its fans. If consumers open a Daily Show email on an iOS device and they have the Comedy Central app, they can click on the email and go straight to the app to watch a full episode, Levitt says. However, if fans haven’t downloaded the app, the network can include a link inviting them to do so. Comedy Central launched its app this past April and received more than one million downloads in less than six weeks. “We’re being strategic in terms of what options we give you and how we make it easier for you to find the content that you love,” Levitt says. For more information, please feel free to reach out to us at contact@movableink.com. Bass Pro Shops Reels in Holiday Email Revenue! Back in July Bass Pro Shops’ #REELTHANKS campaign made our list of Emails We Love. Their integrated digital campaign sought to increase social engagement and give back to the community through AMVETS. They used device targeting to send optimized emails for desktops, tablets, and mobile devices as well as streamed live social feeds and used deep linking to make it easier for their subscribers to tweet and post with just a click – and it worked! The #REELTHANKS campaign generated over 1,500 tweets and 4,000 Facebook shares. Using agileEMAIL Bass Pro Shops increased click through rates by 23%, transactions to click rate by 53%, and mobile email click rate by 28.5%. They execute cross-channel promotions and create in-store and digital synergies to drive customer engagement; so you can bet these strategies are going to extend into their holiday planning. 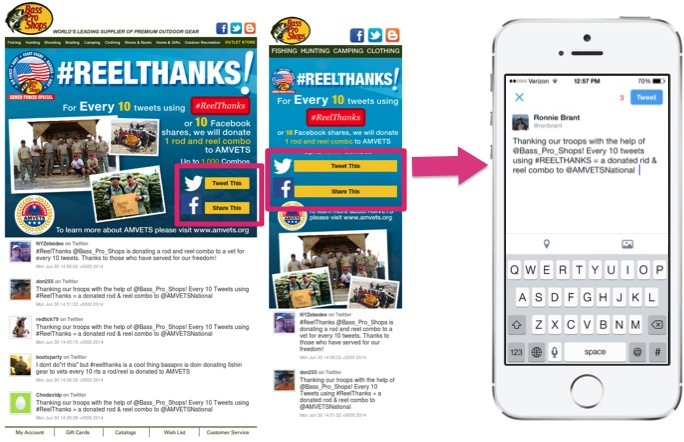 See what Bass Pro Shops has in store for their holiday email strategy and how it will reel in more holiday revenue by creating the ultimate customer experience both in-store and digitally. Register now for our next Holiday Hit List webinar with Bass Pro Shops so you can tackle your holiday email strategy! You’ve heard it many times before – the claim that “email is dead.” But that’s just not true. In fact, TechCrunch says that email newsletters are hot right now. They’ve seen a shift in websites encouraging readers from “liking” them on Facebook, to now getting them to sign-up for an email subscription. 1. Email gives publishers more control: As opposed to social media where you are subject to Facebook’s algorithm or breaking through the noise of someone’s Twitter feed, email will get through to those that have made the conscious choice to sign up for your newsletter. 2. Readers pay more attention to email: Just do your own comparison. How many email opens do you receive vs. clicks on a link you tweet about? 3. Email is cross platform: Email works on everything, even if you’re still on dial-up internet. 4. Email keeps all your clutter in one place: If you were given the choice to receive all your information in one place (your inbox) or search 12 different (social media) platforms for updates, which would you choose? Case closed. Here you have it, email is very much alive and kicking and here to stay. Now it’s time to be faster, smarter and more measurable about your email marketing. What have you done so far and have you moved the needle this year? How are you talking to your customers as individuals? Are you just thinking about the tactical execution of your program vs. thinking strategically? 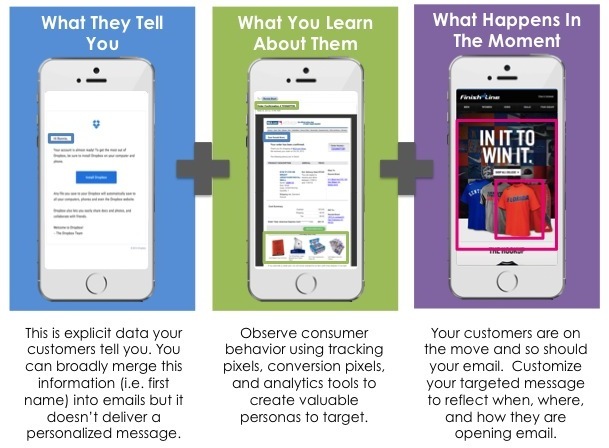 DATA: Matt defined three types of data you can use to personalize your emails. Combine your learnings to create a message that is personalized to your customer’s environment. RECOGNITION: Ryan Phelan said “the goal of email marketing is to recognize your customer for who they are.” Using data, figure out who your customers are and what they want to see. Using segmentation deliver an email with the message and creative that will appeal to them. If you haven’t segmented your list, you need to start but start simple. Check out how Ryan show’s you how to go from a simple to complex segmentation. TEST, TEST, AND TEST SOME MORE: Don’t let the business of holiday prevent you from testing. Test to see what works and then what works better. Here are a few ideas about what to test: subject line, lifestyle images, headline, copy length, CTA. Check out this surprising example of what email won out of 84 tests in the Obama email campaign. Watch the full webinar recording for more email personalization tips and create truly personalized emails for holiday. Continue the conversation with @movableink on twitter using #HolidayEmail.